For players who don't use their tremolo, blocking it to prevent it's movement can remedy some common headaches associated with Floyd Rose and other floating tremolos. If all strings are removed at once it is time consuming to re-tune the guitar. When one string breaks, all other strings go out of tune. String bending can cause other strings to go slightly out of tune. Blocking the tremolo requires blocks to one or both sides of the inertia block to prevent it from moving. This makes the bridge behave more like a hard tail bridge, eliminating common headaches. Fortunately this change does not modify the instrument, nor is it permanent. It can always be reversed, making it ideal for collectible instruments that need to stay original. Mahogany wedges on each side prevent movement. In order to increase the benefits behind blocking the tremolo, a hard wood is used for the blocks. Normally mahogany, rosewood, maple or ebony. 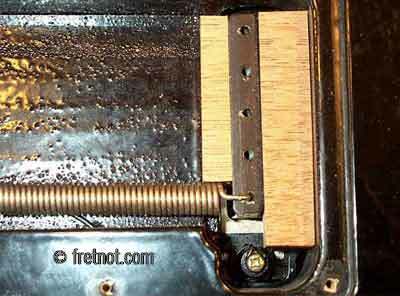 A second method is to place one block to the front side and use several tremolo springs to pull the tremolo tightly against the block. 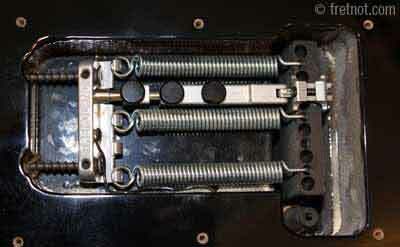 Some tremolo stabilizers can also be used to immobilize tremolo movement. The Tremol-no® makes locking and unlocking very easy. A thumb wheel is used to lock down the tremolo when not needed, or simply to facilitate easy re-tuning after string changes. This would be my choice for those who feel there may be some instances where they may wish to use the tremolo but find themselves aggravated by common floating tremolo issues.